I can't thank Southern Stamped Jewelry enough, for the care they took with a very special gift given to me by my late father-in-law. They transformed this gift into the most beautiful charm bracelet I have ever laid eyes on. I will treasure it forever. My husband even said that the bracelet is perfect and his father would be proud! Thank you all so very much!! Such a wonderful experience. Sweet, friendly, knowledgeable, easy to work with and most importantly, gorgeous jewelry at a great price. 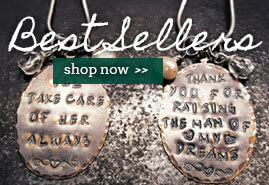 I would not hesitate to recommend Southern Stamped Jewelry to anyone. You won't be disappointed! I love this company!! I'm always thinking of them when it comes to a gift my best friend christy rogers loves her best friend key chain i bought her i also bought rings and a memorial necklace too love them! You honestly never can tell how something will be until you receive it. The quality of their products do not come across in pictures. Custom made with care. Thank you so much for the amazing detail they were exactly what I needed. I just want to thank Southern Stamp for the beautiful necklace they made for my future mother in law! Not to mention I accidentally ordered the wrong style and they took care of me easily and their customer service was the BEST! Thank you guys for everything, she's been wearing her gift everyday! This won my mother in law over. She absolutely adores it! And my boyfriend also ordered me a bracelet from SSJ. It's a bear with "mama bear" stamped on it and my daughters birthstone. It's so cute! My father passed away two years ago and I have been wanting one of there necklaces since I first saw them right after it happened. It is absolutely amazing and means so much to me I love it!!! Highly recommend to everyone and anyone that would like one you can customize it however you want which is amazing and it's just perfect. I wear mine ever day! This necklace is so beautiful and original. It makes me feel even closer to my dad, just lost him last August. 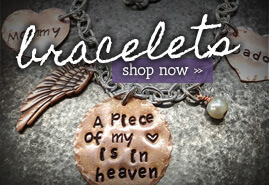 Thank u for beautiful, affordable and heart warming jewelry! 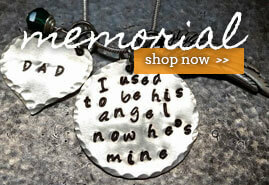 I ordered this necklace to remember my mammaw. She was the woman I wanted to be so much like. This necklace is amazing. 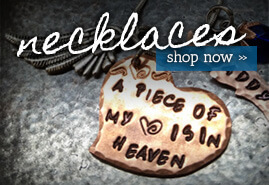 I love my necklace and will be buying any other stamped jewelry from this site. I've seen this product advertised several times online and always thought to myself that I should get something for my mother-in-law. I ordered the bracelet for her birthday. I added her birthstone and my husband's. She loves it! It came out better than I could have expected! Thank you!!! I can't wait to give this to my mother-in-law! This necklace is just enough to be beautiful, but not too girly or fragile looking. This is the perfect gift and the shipping time was amazing!! Get special offers and flash sales by signing up for our fan club!